Radio-Carpal Joint is the wrist joint that lies in the middle of the lower end of radius and carpus. It is a synovial joint of ellipsoid variety. The inferior surface of the lower end of radius and inferior surface of the triangular articular disc of inferior radio-ulnar joint together forms Proximal articular surface. This proximal articular surface is concave from side to side and almost elliptical in shape. Distal articular surface is formed by the proximal surfaces of scaphoid, triquetral, and lunate bones. It is smooth and convex. Although wrist joint is an articulation between forearm and hand, the medial bone of forearm — the ulna is excluded from this articulation by an articular disc. In the neutral position of the wrist, only the scaphoid and lunate are in contact with the radius and articular disc; the triquetral comes into contact with the articular disc only in the full adduction of the wrist. The pisiform bone also does not participate in this articulation because it acts primarily as a sesamoid bone to increase the leverage of the flexor carpi ulnaris and lies in a plane anterior to the other carpal bones. Capsular ligament (joint capsule): It is the fibrous covering of the joint and is attached above to the distal ends of radius and ulna, and below to the proximal row of carpal bones.The synovial membrane lines the inner surface of the fibrous capsule and extends up to the margins of the articular surfaces. Radial collateral ligament: It extends from the tip of styloid process of radius to lateral aspects of the scaphoid and trapezium. It is related to the radial artery. Ulnar collateral ligament: It extends from the tip of styloid process of ulna to the medial aspects of the triquetral and pisiform bones. Palmar radio-carpal ligament: It extends from anterior margin of the lower end of radius to the anterior surfaces of the scaphoid, lunate, and triquetral bones. It is formed due to thickening of the lateral part of the anterior aspect of the fibrous capsule. Palmar ulnocarpal ligament: It extends vertically downwards from the base of styloid process and adjoining part of articular disc to the anterior surface of the lunate and triquetral. It is formed due to thickening of the medial part of the anterior aspect of the fibrous capsule. 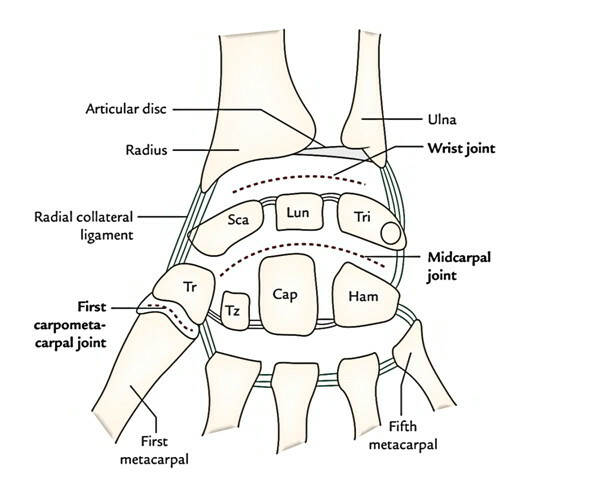 Dorsal radio-carpal ligament: It extends downwards and medially from the posterior margin of the lower end of radius to the dorsal surface of the scaphoid, lunate, and triquetral bones.The strongest bonds of union of wrist joint are ulnar and radial collateral ligaments. Tendons of flexor digitorum superficialis (FDS), flexor digitorum profundus (FDP) and associated synovial sheath (ulnar bursa). Tendon of flexor pollicis longus (FPL) and associated synovial sheath (radial bursa). Tendon of flexor carpi radialis and associated synovial bursa. Extensor Tendons Of Wrist And Fingers, And Associated Synovial Sheaths. Radial artery (across the radial collateral ligament). Tendon of abductor pollicis longus (APL). Tendon of extensor pollicis brevis (EPB). Dorsal cutaneous branch of ulnar nerve. Flexion and extension occur along the transverse axis, and abduction and adduction occur along the anteroposterior axis. The movements at the wrist joint are usually associated with movements at the midcarpal joint (joint between the proximal and distal rows of carpal bones). The wrist and midcarpal joints together are considered as link joint. Rotation is not possible at the wrist joint because the articular surfaces are ellipsoid in shape. The lack ofrotation at wrist is compensated by the movements of pronation and supination of the forearm. The wrist complex consists of radio-carpal joint and midcarpal joint. Flexion is assisted by long flexor tendons of digits (e.g., FDS, FDP, and FPL). It occurs more at the midcarpal joint than at the wrist joint. Extension is assisted by extensors of the digits (e.g., extensor digitorum, extensor digiti minimi, and extensor indicis). It occurs more at wrist than at midcarpal joint. Abduction occurs more at midcarpal joint than the wrist joint. Adduction mainly occurs at wrist joint. Flexion and extension of the hand are actually initiated at the midcarpal joint. Superficial positions of nerves, vessels, and tendons at wrist make them exceedingly vulnerable to injury. Ganglion (Gk = swelling or knot): It is a non-tender cystic swelling, which sometimes appears on wrist most commonly on its dorsal aspect. Its size varies from a small grape to a plum. It usually occurs due to mucoid degeneration of synovial sheath around the tendon. The cyst is thin walled and contains clear mucinous fluid. The flexion of wrist makes the cyst to enlarge and it may become painful. Aspiration of the wrist joint: It is usually done by introducing the needle posteriorly, immediately below the styloid process of ulna between the tendons of extensor pollicis longus and extensor indicis. Immobilization of the wrist joint: The wrist joint is immobilized in its optimum position of 30° dorsiflexion.